The tibia and fibula are the two bones of the lower leg. 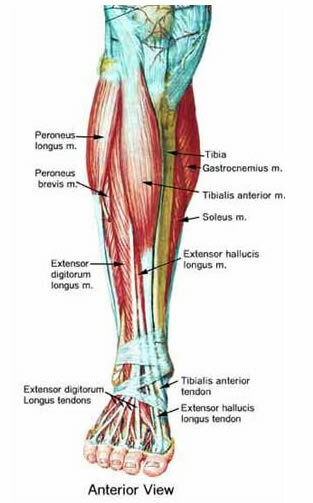 The fibula terminates and is palpable as the “lateral malleolus” at the outside of the ankle. 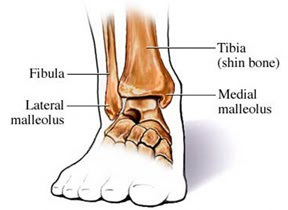 The tibia is thicker, but it has a bony prominence on the medial side (inside of the ankle) known as the medial malleolus. The distal tibiofibular joint: The first joint, the distal tibiofibular joint is the articulation between the tibia and the fibula just above the ankle. Though not a true synovial joint, (not encased or filled with fluid) this joint is what gives stability to the ankle mortice (the bottom of these two bones form the “dome” for the talus (part of the next joint). The distal tibiofibular joint consists of the articulation of the medial side of the fibula and the lateral side of the tibia. It is supported by the interosseus membrane of the lower leg, and two small ligaments. It allows only a small amount of movement with plantar flexion/dorsiflexion of the ankle. This is the joint that is most affected during a “high ankle” sprain. The talocrural joint: (or “True Ankle Joint”) This is composed of the dome formed by the ends of the tibia and fibula and the the talus. This joint is encased by a joint capsule and is a true synovial joint. This joint allows only plantarflexion and dorsiflexion (pointing the ankle down and flexing it up respectively). 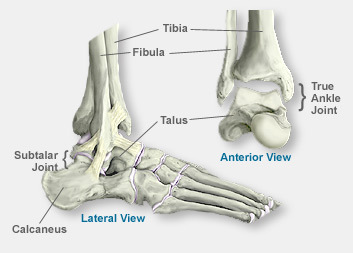 The subtalar joint: Located just underneath the talocrural joint, the subtalar joint (meaning “under the talus”) allows for the side to side motions of inversion (ankle and foot twisting in) and eversion (the ankle and foot twisting out). This joint can arguably also be considered part of the foot as it is formed by the talus and the calcaneus (the heel bone). There are six major ligaments in the ankle. Five are along the lateral (or outside) of the ankle and one is on the medial (or inside). The posterior inferior tibiofemoral ligament and the anterior inferior tibiofemoral ligament stabilize the distal tibiofemoral joint. These are important in gymnastics as they can be weakened by landing “short” on a backward tumbling element repeatedly. When this happens, the talus is jammed up into the space between the tibia and fibula and over time this mortice becomes more flexible. With this, the talus can move beyond the normal range. This leads to an unstable talocrural joint and can cause the talus to “sublux” or get stuck out of place. In this case, the gymnast will complain of anterior ankle pain with flexing the ankle/foot or when squatting and may have a noticeable loss of dorsiflexion. It also predisposes a gymnast to ankle sprains and can lead to an earlier onset of arthritis in the joint. The other three ligaments are the ligaments most often injured in ankle sprains. These support the subtalar joint, though they cross the talocrural joint as well. 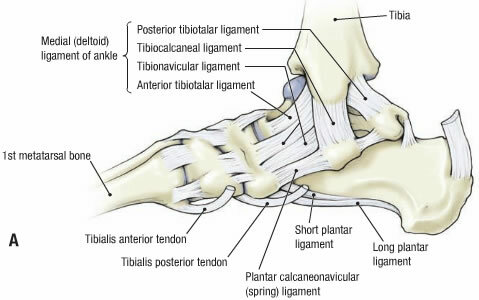 They include: the anterior talofibular ligament, the calcaneal fibular ligament, and the posterior talofibular ligament. All three originate from points on the lateral malleolus and terminate on either the talus or the calcaneus. The ligaments along the medial side of the ankle are more numerous and thicker (making them stronger than the lateral ligaments). They share common origins and insertions and are collectively known as the deltoid ligament. This ligament prevents eversion and is traditionally only injured in the most severe of ankle injuries (dislocations, fractures with dislocation). 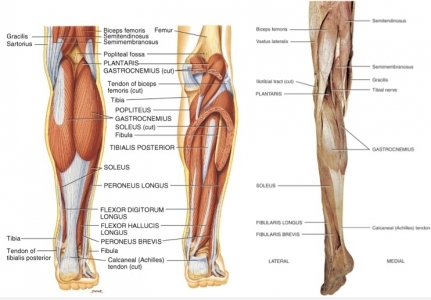 These muscles all sit in the lower leg and cross at the ankle. Their tendons are longer and are covered in tendon sheaths that protect and lubricate them as the run along the medial and lateral malleolus of the ankle. This entry was posted in Ankle/Foot on September 30, 2012 by Angie. Hmm it looks like your site ate my first comment (it was super long) so I guess I’ll just sum it up what I wrote and say, I’m thoroughly enjoying your blog. I as well am an aspiring blog writer but I’m still new to the whole thing. Do you have any recommendations for rookie blog writers? I’d really appreciate it. Thanks for the feedback. I’m relatively new to blogging too. A good friend advised me to choose something that I was passionate about and write from experience. It’s worked so far! I hope that helps! What’s up colleagues, its wonderful paragraph about tutoringand entirely explained, keep it up all the time.